Since its founding in 1942, Koinonia Farm has been growing and serving delicious food. In 1956, we began our mail order business and it has supported the life and work of the community ever since. You’ll find biologically grown pecans, hand-poured Fair Trade Chocolate, handmade Bakery Goods, Fair Trade Coffee, Tea, and Cocoa, books, and other partnership goods. All of our products reflect our desire to care for people and the land they work all over the world. Koinonia Farm is a place of hospitality and we’d love to have you visit. You can see where the pecans are grown, the Fair Trade Chocolate is poured, the Date Nut Bread is baked, and the community lives and works together. Every purchase you make helps us serve not only you, but those in need through our many service to others projects. Thank-you! 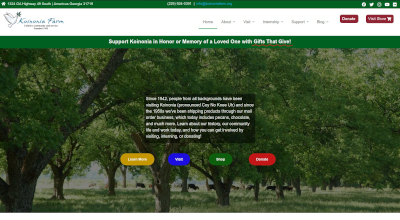 Learn more about Koinonia Farm and register to visit us on our website. We'd love to show you around the farm!